My Nan was born and raised just outside Pontypool and I have family who still live in the area, they know when I’m coming to visit and bring out the welsh cakes. My addiction to these little drop scones of Godliness knows no limits. I can polish off 6 in one go. Hell, if I didn’t get the food guilts, I could polish off double that. 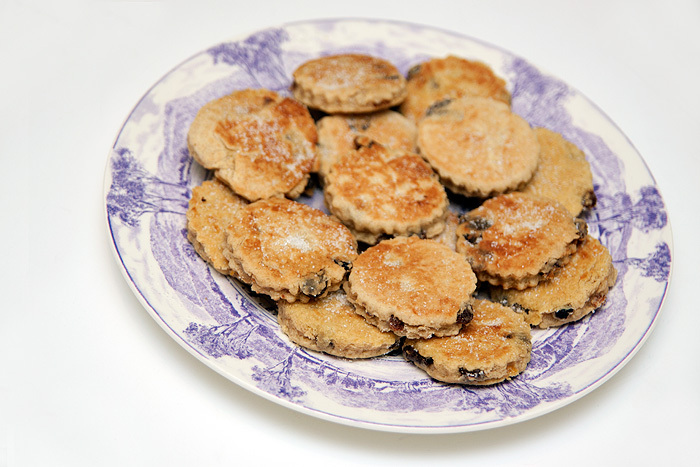 They’re traditionally made on a Bakestone, a cast-iron griddle. It’s important that the heat distribution is even which is why a well-seasoned griddle is best. I don’t have one so made do with a very heavy-bottomed (cough) frying pan. My Nan’s Bakestone is somewhere in the family and I might just have to start hunting it down. They’re exceptionally easy to knock together… if you do attempt it, you may aswell double the recipe RIGHT NOW because I can assure you that although these will keep for a week in a tin. Most of them will be long-gone by teatime. 1. Sift the dry ingredients (not the sultanas) into a bowl before rubbing the butter into the mixture until it resembles fine breadcrumbs. 2. Break the egg into the mixture and combine. 3. Stir in the sultanas and use your hands to bring the mixture into a dough. If it needs it, add a dash of milk (just a drop) to bring it all together. 4. On a floured surface, roll the dough out to around a CM thick and use a glass or (large) cookie cutter to cut into rounds. Any leftovers can be re-rolled and cut until all the dough is used up. 5. Heat your griddle/pan until hot and drop a little butter onto it to grease the surface. You’re not shallow frying! Just a little will do. 6. 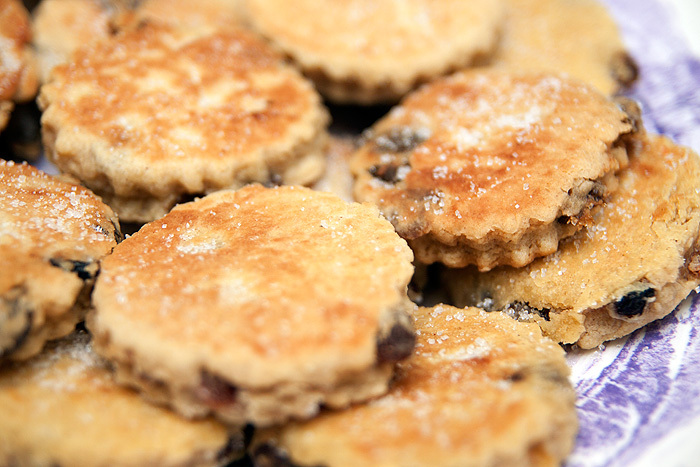 Cook the welsh cakes for around 3/4 minutes on each side. They can catch very quickly so lift them to check they’re not burning occasionally. Once browned on each side, they’re done! Sprinkle with sugar and eat! Mr London loves these. I might have to give the recipe a go next time I need to bribe him. Welsh cakes in return for looking the other way next time he sees a yellow bag? You will have to let me know when you are over this way again, They looks delicious and I agree you can’t just eat one! Oooh do try them, proper ‘memory’ food. Even just the smell of them cooking! I love Welsh cakes! Nom! We love these – I make them gluten-free so that my coeliac son can enjoy them too, and they still ‘work’ – funnily enough my nan grew up just outside Pontypool too – my mum was born there, but left aged seven! Luckily the tradition lives on in Surrey! Delicious! Jamal’s family still live in the Valleys, around Trethomas! Depends how big your cooking surface is. I did 4 at a time. They’re really easy to turn just totally leave them to it for the first 2 minutes… they firm up. Then peek to see if they’re browning… when they’re a nice medium brown, turn em over (I use my finger and a fish slice). And let cook on the other side. They’re not at all sloppy or tricky like pancakes. I love welsh cakes, best served with jam or strawberries in my opinion, and being a valleys girl myself I always feel a sense of pride.